Standing tall and prominent as one of the most interesting and unique tourist spots of Jaipur, Gaitore is a structure like no other. Being a royal cremation ground for the prestigious Rajput families of Rajasthan, Gaitore presents a marvellous architectural brilliance that you just can’t miss. As it is, Gaitore has the reputation of being part of the most beautifully constructed mausoleums in Rajasthan, and especially in Jaipur. Here are some interesting things to know about Gaitore which will definitely have it on your list of places to see in Jaipur. Gaitore is derived from the hindi words ‘Gaye Ka Thor’, meaning ‘resting place of the departed’. It was the designated cremation ground of the Kachhwaha Rajputs of Jaipur, one of the most well-known royal families in Rajasthan. Gaitore is situated on the Jaipur-Ajmer highway, in an isolated location where its mesmeric architecture combines with the natural abundance of the surrounding area. Cenotaphs that loom over the building are designed from marble and sandstone, a rather common speciality in the architecture of Rajasthani royal structures. Gaitore is constructed with the blend of Mughal and Rajput design, which gives it an unforgettable allure. The notable names that have cenotaphs dedicated to themselves are Sawai Ram Singh, Sawai Madho Singh, Maharaja Sawai Singh II along with many others. The mausoleum that stands out the most is that of Maharaja Sawai Singh II, which has carvings of an intricate and beautiful manner, including detailed designs of peacocks on the cenotaphs. Every cenotaph has a distinct nature of carvings based on the kind of preference their respective kings had. This gives a unique quality to each of them, making it easier to differentiate. 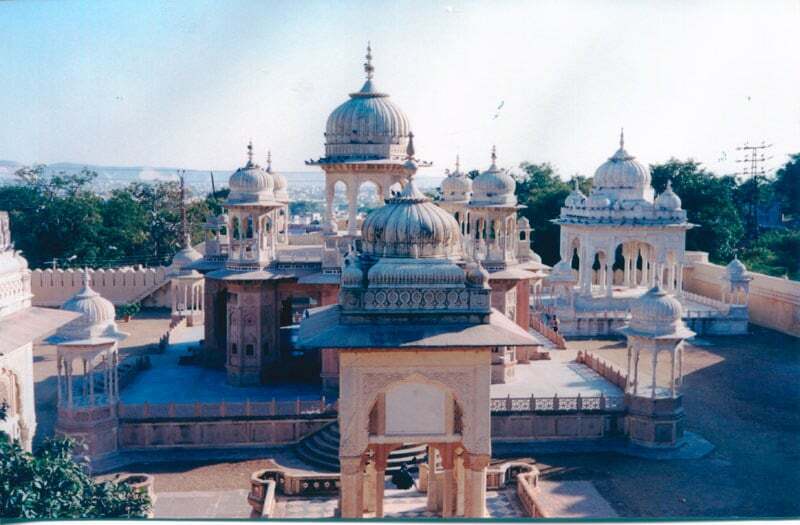 Maharaja Sawai Jai Singh II, the founder of the city of Jaipur had the cremation ground of Gaitore built for himself and his family. Every Kachhwaha king of Jaipur had his cremation at Gaitore post its creation in the year 1733. The only king whose cremation didn’t happen in Gaitore was Maharaja Sawai Ishwari Singh. His cremation took place in Jaipur’s famous City Palace complex. The walls of Gaitore’s cenotaphs and mausoleums were decorated with various paintings, traces of which can still be found on some of the walls. As a structure that has stunning architecture and designs of Islamic and Hindu origin like no other, Gaitore has gained a great reputation amongst tourists. It is one of the most-visited tourist destinations of Jaipur. The cenotaph of Maharaja Sawai Singh II, which is constructed in white marble that still retains its purity, has gathered more attention than any other at Gaitore. The carvings of each cenotaph in Gaitore are unique and present a separate quality of architecture that deserve every bit of a visitor’s attention. As the cenotaph of Maharaja Sawai Singh II is the most unusual and stunning one, visitors enjoy observing the delicate carvings of peacocks on it. Gaitore is located only 16kms from Jaipur, so it is a must-visit tourist site near the city which should not be overlooked by potential tourists. A tour of Gaitore amidst the pretty landscape around the mausoleums does not take much time and is well enjoyed during the day as it is easier to take a good look at the intricate patterns wedged into the walls and the domes. Group tours that are organized by many tourist agencies should be taken into consideration as they also provide guides to understand the history of Jaipur and the kings whose mausoleums are built in Gaitore. A day-long tour of Jaipur can include Gaitore well enough without taking up a lot of time in one place. Car rentals are easily obtainable and package tours usually add Gaitore in the mix of a trip to Jaipur’s tourist destinations. Wearing comfortable shoes, carrying hats and sunglasses etc. are recommended to ensure a hassle-free time at Gaitore as Rajasthan can be quite warm during the summers. Local taxis and other means of public transport are easily available, along with the chance of using private vehicles to travel to Gaitore. Given Jaipur’s numerous tourist attractions, Gaitore has the qualities of standing out amidst a lot of other interesting places of the Pink City. For a lover of history and architecture, Gaitore can prove to be one of the most stunning and intriguing creations of the Rajput royal families, who have left their mark on Rajasthan even centuries after their passing.